The night-work on the walls, mostly in the glow of torches, was not without danger. Not so much because it was forbidden, but rather because the Wall was a strictly guarded state property and also on the west side a small stripe in front of the Wall was already GDR territory. Constantly you had to expect surveillance, threatening or even imprisonment. There were small doors in the Wall, that could be used by the GDR guards to get to the other side. Nose, lips, big round eyes, colorful profile pictures – these are the works of Thierry Noir, which can be seen today at the East Side Gallery. Noir, a native born French, has been living in Kreuzberg since the 1980s, attracted by the unique aura of that era, in the shadow of the Wall. Over the years, he has painted several meters of the Wall. The Kreuzberg residents were not always pleased, several times he had to restore his own works. And in the end, he had to stand idly by and watch while his work was sold together with the Wall segments for breathtaking amounts. Ultimately, however, Noir secured by court order his share of the proceeds, along with other Wall artists who fared similarly. Citny, a native of Bremen, came to Berlin in the late 1970s / early 1980s. The art scene in Berlin, especially the scene of Wall artists, was small. They knew each other. The Wall with his work and the work of friends was setting in the 1987 film Wings of Desire by Wim Wenders. After the fall of the Berlin Wall, Kiddy Citnys work was to be seen in international art galleries. The LIMEX sold Wall segments with his work for a lot of money, inter alia, to the Museum of Modern Art in New York. As Citny fought at court for his shares on the proceeds, the LIMEX spoke of property damage. Nevertheless everything went well for him. Weltschmerz poetry – that’s how the taz named the global messages of Jürgen Grosse in 2007. The ex-East German painter went to West Germany in 1956, he begun to paint on the Wall in the early 1980s. 1989/1990 a bet led to a marathon action: In just seven months he has painted 223 Wall segments. This bet was the origin of the global messages, that have contributed to the high attractiveness of individual Wall segments. Some of these messages are still to be seen in some places in the world. The border was opened yet, when East Berlin residents came up with the idea to paint their side of the Wall too. Word spread quickly, and came even to Paris to Daniel Boulogne. Hastily, he gathered artists, tons of paints and brushs, and set off to Berlin to support the East German Artists Association in this campaign. First, Boulogne met unexpected resistance, crossing the inner German border was not granted these days, especially not with two tons of paint in cargo. After some delay, the action finally began at Potsdamer Platz and pulled down the Leipziger Straße. In the afternoon, the action was blown up by GDR border guards, calling on the activists to stop work immediately. As most artists had finished their work anyway, the action was over – at least for the artists. The GrePos (german abbr. for border police) had still to execute a command: In a cloak and dagger operation, they had to whitewash the just created works. However, the colour they used was of so poor quality that shortly thereafter the original works surfaced. When the section was demolished later, Boulogne secured two segments of it and bequeathed it to the Mémorial de Caen in the Normandy. The graffito on the segments Hase bleibt Hase is a work by Manfred Butzmann, East German artist and guest lecturer at the Art Academy Berlin-Weissensee. Kaun painted the graffito Kings of Freedom, which extends over four segments. These segments were bought by Robert Hefner III. for his Hefner Collection and were initially exhibited in Oklahoma, then probably in Aspen, in any case in Singapore, before Hefner took it to his retirement home in Virginia. The sales price was allegedly in the upper six figures. Whether and how much Kaos get of it, who has contributed significantly to the value of the wall segments, is not known. In the 80s, Dennis Kaos Kaun was one of the internationally-known Wall artists. Later he changed the paint cans against turntables and reassumed as DJ. The German-Iranian artist Kani Alavi has earned wide acclaim for his work for the East Side Gallery and in 2011 was awarded the Federal Cross of Merit. Alavi is chairman of the Artists Initiative East Side Gallery. The East Side Gallery began with the renovation of the Berlin Wall in October 2008 with funds from the German Lottery and with public funds. Alavi was one of the first artists who went to work at the Mühlenstraße in 1990: The East Side Gallery, the largest open-air gallery in the world, became famous all over the world with Alavi’s work and the works of more than 100 other artists. Also original by Alavi is the art work on the Wall segment that Kofi Annan received, and that is standing at the United Nations in New York. Painter, contributor to the East Side Gallery: He painted the Bruderkuss (Brezhnev / Honecker) in the spring of 1990, a few months after the opening of the Wall. Vrubel was one of 118 artists from 21 countries, who painted the 1,316-meter-long section of the Wall in the Mühlenstraße parallel to the river Spree between Ostbahnhof and Oberbaumbrücke. 106 large-scale murals are showing their visions of change in 1989/90. A few days after the opening of the East Side Gallery, on September 28, 1990, the GDR ceased to exist. Wasecki, who has been living in Berlin and practicing as a dentist, has drown attention through his artwork: Immediately after the fall of the Wall, he began his monumental artworks and installations with Berlin Wall replicas on a pasture in Poland. One thing led to another, today Wasecki owns about 50 original Wall segments. His works, which he created from these, had a major impact, some went on tour and were issued abroad. In a speech at Westminster College in Fulton, Missouri, Winston Churchill coined the term of the Iron Curtain in 1946. When the Iron Curtain raised, the New York based artist Edwina Sandys intended to create a monument for this historical location in Fulton. In 1990, Sandys, granddaughter of Winston Churchill, addressed the idea of the project to the still acting East German government and received favorably eight segments, from which she formed her artwork Breakthrough. Another Wall artwork by Sandys, Freedom from Fear, which is a cutting out of Breakthrough, can be seen in Poughkeepsie, New York. The cultural scientist Hagen Koch is probably the most meticulous Wall documenter. Hardly surprising, since he has a very personal relationship to the Berlin Wall: Koch was born in Dessau in 1940, initially trained as an engineering draftsman and was non-commissioned officer of the Berlin Guard Regiment Feliks Dzerzhinsky from 1960. During this period he painted the course of the Wall on the pavement for Walter Ulbrich at Checkpoint Charlie and later mapped and documented it meticulously. 28 years later, in November 1989, Koch has got another important official order: He should tear down the Wall now. In 1994, he founded the Berlin Wall Archive Hagen Koch. Like no other, he knows every square inch of the anti-fascist protection Wall. After September 28 in 1990, the owner of the wall changed. The GDR was history, the border fortifications were now property of the Federal Republic of Germany. In October 1990, the then Commissioner for the dissolution of the former border troops got the order quickly to clear up 1,393 km border barriers, completely remove the Berlin Wall by December from the cityscape. In addition, Ocken was tasked to market valuable materials worldwide. Purchase requests already existed, loads of new ones came and Ocken sold, sold, sold … The command was fully executed, the Wall was on time off and increased the defense budget of the FRG with the sale proceeds to six million DM. However, this contrasted with personnel and equipment costs for dismantling in the amount of 170 million DM. As soon as the Wall was opend, the Mauerspechte went to work with hammer and chisel, with drill and jackhammer, to ensure their piece of the border rampart. Some clever Mauerspechte went on to sell small chunks. Suddenly a lucrative market was born. And then there was Volker Pawlowski, he soon started business with a recycling firm in Brandenburg. He crushed whole segments himselve, grabbed small chunks into bags, stuck others on cards, certificates included, and became within a short time a quasi-monopolist for Wall souvenirs. For Pawlowski the fall of the Wall was a personal windfall, the reason of his rise from construction worker to high-income entrepreneur. In the beginning of 1990, Winfried Prem, demolition contractor from Weiden, received the contract of his life: the demolition and crushing of 200 kilometer Wall. Client: the National People’s Army of the GDR. It took three years to finish the job – with up to 20 excavators and ironically several former border guards as employees. Initially, camera crews from around the world reported on the work. Heads of state, celebrities, even Prince Charles personally shook his hand and expressed their appriciation for the work he was doing with up to 70 people. The National People’s army nominated him as major honorably. In the mid-1990s, the job was done. The shredded Wall, around 180,000 tons concrete, was mostly used in road construction – as underlay for the busy Berliner Ring. What exactly happened in November 1989 – historians have to explore more thoroughly and try to explain. Anyway, many were surprised by the sudden fall of the Wall, and the sudden onset of demand for parts of the border fortifications, especially of the Wall. Initially, requests were quickly sent to the GDR Ministry of Foreign Trade, to the KoKo empire of Alexander Schalk Golodkowski, chief foreign exchange buyer. Golodkowski tasked the West experienced construction company LIMEX to take care of the supposedly big business, henceforth. As of October 1990, the responsibility was transferred to the Federal Republic of Germany, the German Defense Ministry was now in charge, and the German Budeswehr was tasked with the demolition. Any requests were forwarded to Bonn, while the US City Commander safeguarded the interests of the United States. Born in East Berlin, Golodkowski was in the GDR era head of the secret area Commercial Coordination at the Ministry of Foreign Trade, best known in the West under the awarded titel chief foreign currency procurer: Finally he arranged with Franz-Josef Strauss a billion credit, which saved the GDR from ruin years before the fall of the Wall. In January 1990, Golodkowski moved to Tegernsee and set up a Wall segment on his property there. In the following years, Golodkowski was faced with criminal proceedings because of his previous activities. The sentences were suspended. Since the Berlin Wall suddenly became a valuable asset, the East German government did everything to make the best possible business. East Berlin government trading company VEB LIMEX henceforth was responsible for the sale of the anti-fascist protection Wall. Helge Möbius was the LIMEX’ director. Some government authorities had guessed sales proceeds of eight billion dollars, which should benefit the culture and the health care system of the GDR. This fantasy was inspired by an alleged quote from Barry Stappler, businessman in Encino, California, who wanted to buy the entire Berlin Wall at $ 50 million. In the beginning of 1990, during a trip to the US for sales negotiations, Möbius himself expected prices from 25,000 to 35,000 marks per segment. Depending on location and graffiti. Segments where people have been shot, were explicitly excluded from sale. The VEB LIMEX was a company of Schalk Golodkowski’s KoKo empire and sold 360 segments with certificates of authenticity until the end of its business. Places of Origin: Potsdamer Platz, Brandenburg Gate (dismantled in November / December 1989), Waldemarstraße, Luckauerstraße (dismantled in January 1990), Markisches quarter (dismantled in April 1990). The graffiti on these segments were painted or sprayed between 1983 and 1989. Behind the BCG is Joseph Sciamarelli, businessman from New Jersey. Fascinated by the events in distant Europe, he asked friends in Berlin, to send him some chunks. These souvenirs were of so much interest at the US east coast that he came up with the idea to bring entire segments into the States. Originally, the BCG wanted to equip even all American city named Berlin with a segment of the Wall. In order to stimulate the market, the first two segments were brought to New York City in January 1990, staged wih media hype and audience appeal on the aircraft carrier museum USS Intrepid. From Germany came along: The artist Peter Max, who took with his people the PR and of course the LIMEX CEO Helge Moebius and Hagen Koch, responsible for the demolition. The idea was a winner and the BCG, as the exclusive partner of VEB LIMEX, henceforth focused on winning museums, galleries, universities, private collectors and former presidents as buyers on the American market. Years later, Sciamarelli shows himself disillusioned: Financially, the commitment was not the big win, but in terms of life experience. Grunske operates a recycling firm in Oranienburg. In 1990, he was commissioned with the demolition of the northern part of the Wall. Some segments are still at his premises. Unlike other companies that still have Wall segments, he isn’t doing business with it, for public purposes they are free of charge. Transportation and installation, however, must be paid. Haddock, commander of the American sector from 1988 to 1990, was one of four city commandants in Berlin. Haddock ensured the transport of three Wall segments to Fort Knox and the erection in the General George Patton Museum. As a commandant of the city at the Wende, Haddock was well-placed. He gave three Wall segments to US President Ronald Reagan, who set them up in Fort Leavenworth. Princess Rizzoli, widow of the Italian publisher and film producer Angelo Rizzoli (worked with Fellini; member of the banned lodge P2) was one of the prominent visitors of the auction in Monte Carlo in 1990. She has bought one segment and set it up on her estate in French Cap Ferrat. Rizzoli International Publication is owned by RCS Media Group today, the corporation includes the daily Corriere della Sera, an Italian high-circulation newspaper. The Cognac empire needs no explanation. The brand has been known since 1765, Ljjiljana is the heiress. In 1990 in Monte Carlo the former Yugoslav actress has auctioned a Wall segment – in her own words for sentimental reasons – for the park of her family home. For Hans-Olaf Henkel the collapse of the political system in Eastern Europe was a chance. He was actively involved into the new beginning, also driven by personal motives. At the time the Wall came down, Hans-Olaf Henkel was managing director of IBM Germany, Chairman of the Federation of German Industry and shortly thereafter advisor of the GDR transitional government and member of the Board of Directors of the Treuhand. He set up a Wall segment on his French estate and some others on IBM sites in Germany. These Wall segments are telling a love story, which ends with the insurmountable Wall. They are telling a funny story from the transport to France and the local reactions. And they are especially telling an exciting story about the period of political transition. These stories might be quiet interesting, while this is not the place to tell them. They are better told elsewhere. The place where the Blessed Virgin Mary appeared to some shepherds became a famous pilgrimage site: Fatima. Years after the apparition the prophecies were recorded in writing, approved by the Catholic Church and finally released. In this context the most significant is the one, that foresees an end to the communist system. Virgilio Ferreira, a Portuguese living in Germany, was deeply impressed by this: As evidence of the truthfulness he donated a Wall segment, the symbol for the end of the communist system, to the pilgrimage site in the beginning of the 1990s. Roofed, to protect it from wind and weather, placed behind glass, consecrated by Pope John Paul II, in this sanctuary the Berlin Wall is now also an evidence of the truthfulness of a prophecy. Peter Garth Palumbo, Lord Palumbo, is a developer, art collector, architecture lovers, Member of the House of Lords, was a trustee of the Tate, the Whitechapel Gallery and the National History Museum, Chairman of the Serpentine Gallery and the Arts Council of Great Britain, played polo in a team with Prince Charles. He owns the Farnsworth House in Illinois, designed by Mies van der Rohe, as well as one of the last residental houses designed by Frank Lloyd Wright in Pennsylvania, and owned at one time the Maison Jaoul close to Paris by Le Corbusier. Lord Palumbo has auctioned several segments at an auction in London in 1994. Founder and owner of the GHK Company, an oil and gas company in Oklahoma. He is also interested in contemporary Chinese art and operates with his wife, the world-famous Hefner Collection. Deeply impressed by the events in Europe in 1989, he sent his curator with the mission to Berlin to buy as much of the Wall as possible. The result was the purchase of four segments with the graffiti Kings of Freedom by Dennis Kaun aka Kaos. 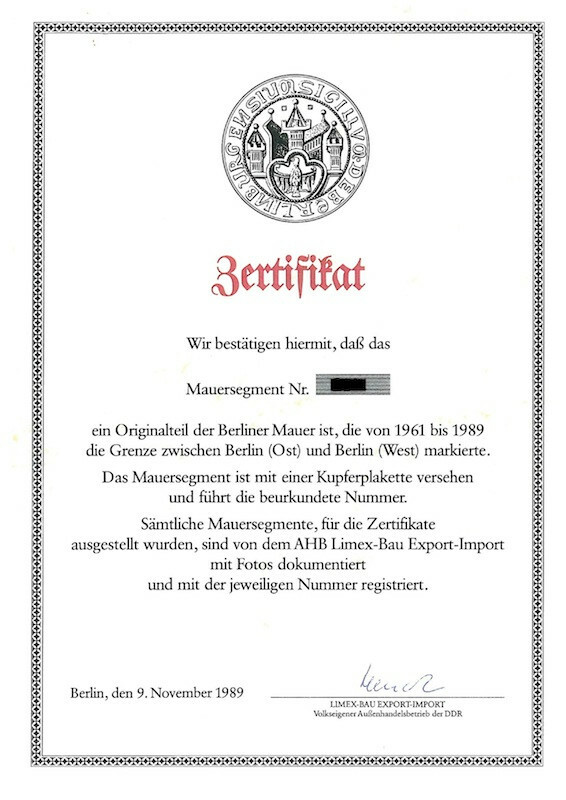 The sale was handled by the LIMEX and their agents for America, the Berlin Wall Commemorative Group. The segments were first issued in Oklahoma, then possibly in Aspen. As Hefner and his wife moved to Singapore, he took the segments along. The Government in Singapore made a specifically public place available. In 2014 Hefner retired and moved back to the States, to his estate in Virginia. The wall segments came back to the United States too. This time he set them up on his winery nearby Virginia State University. Born in Rome in 1952, Marco Piccininni moved with his family to Monaco in the 1960s. After studying architecture, he was thrilled by the banking system and the motor sports: He was a bank director and founding member of a Monegasque racing car manufacturer. His passion for high-horsepower cars took him later to Ferrari in different functions. Piccininni was vice president of the FIA, president of the Italian Automobile Association, temporarily Minister of Finance in Monaco, Monegasque Ambassador to China and India. On the auction in Monaco, Piccininni has got a segment that he donated to Pope John Paul II immediately. It is now on display at the edge of the Vatican Gardens. When the Berlin Wall was built, Axel Springer (1912 – 1985) demonstratively built his West Berlin editorial building in the immediate vicinity, in the Kochstraße, to keep in visual range of the other part of the town. Against all odds, he believed in his dream of German unity. As a reminder of this, the Axel Springer SE acquired 33 wall segments and planned to give one segemt to each of the German Federal States as a symbol of the power of freedom and self-determination but also as a memorial of its perpetual endangerment, said Kai Diekmann, BILD chief editor, a daily newspaper by Axel Springer SE. The segments, that were used for the construction of the Berlin Wall from 1976, and which are now set up across the world, were originally developed as retaining wall elements for agriculture. They should serve as fastening for feed silos. After the fall of the Berlin Wall, there were numerous purchasers of single pieces as well as of larger batches of the border fortifications. One customer was the LPG plant production Breesen – 200 segments are now used in their actual purpose: as retaining wall elements for feed silos. Klaus Knabe was born in 1939 in Pohrsdorf near Dresden. His father was a dedicated member of the Confessing Church. He suffered under the Nazis due to his faith. He was sentenced to prison, could not practice his profession afterwards, and ended in Soviet captivity and starved to death after the war. The history has partly repeated for Klaus Knabe: Knabe was dismissed by the National People’s Army due to his faith and beliefs. A study has been denied and many obstacles placed in his way. Shortly before the Wall was built he was tired of the GDR system, Klaus Knabe left his Saxon homeland and moved to Pforzheim. A few years later, he was allowed to travel the GDR, he helped friends and relatives, proved to be a committed democrat, convinced of the principles of the rule of law. After the fall of the Wall and with the support of these friends, Knabe began to gather evidence on how the dictatorship and the unjust regime has influenced people’s everyday lives. Finally, he founded the Vereinigung gegen das Vergessen in Pforzheim, which operates a unique and highly acclaimed museum. Of course a Wall segment is standing there too. Romero, of Spanish descent, grew up in a divided Germany, worked as a journalist when the Wall came down. On November 9, 1989, he arrived at a press conference with the Spanish Prime Minister Felipe Gonzalez in Budapest in the afternoon. When asked, how long the Wall will persist, Gonzales replied that the current development is a lengthy process that will drag on for years. In the evening, the Berlin Wall was opened. In the early morning of the next day Gonzales, Romero and other press companions, overwhelmed by the events, rushed unscheduled to Berlin. About six months later, Romero startet a new professional career as PR expert for unusual marketing activities. He was, inter alia, involved in the formation of the segments in Madrid’s Parque de Berlin and at the monument at the service station Zuasti in the autonomous region of Navarra. The idea, that the Tribuna magazine offered Wall pieces to its readers in order to attract attention and eventually to increase the circulation, came from Romero. © by “BrandenburgerTorDezember1989” by SSGT F. Lee Corkran – DoD photo, USA. Licensed under Public Domain via Wikimedia Commons..